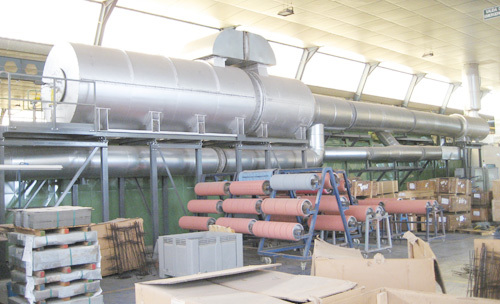 The recuperative thermal oxidation is a purification system in which the air to treat is introduced in a heat interchanger (tubular shape) where it is preheated before entering into the oxidation chamber. In fact, where the gases reach the combustion temperature, between 700ºC and 750ºC (1292ºF to 1382ºF), by means of the heat that a burner fed on any fuel (natural gas, propane,..) contributes, is in this chamber. After remaining in the chamber between 0,5 and 1s, the gases already purified transfer their heat to the heat interchanger before reaching to the atmosphere. To get a better energy efficiency is possible to carry out a secondary recovery, taking a better advantage of the residual heat of the treated gases. This can be to preheat fresh air, to generate steam, hot water or hot air for heating. High percentage of COVs destruction (99,9%). Due to its small size it allows a flexible installation.